RIAA Phono Amplifier with MC Light Powered Step-Up. Many modern preamplifiers are born with a poor Phono Stage - or even without a phono stage all together. Since most audio makers don't expect their customers to use the phono amplifier, not much attention is paid to this particular part of the amplifier. However most people who use the Phono amplifier, are serious about it and spend large amounts of money buying a high quality cartridge and turntable. 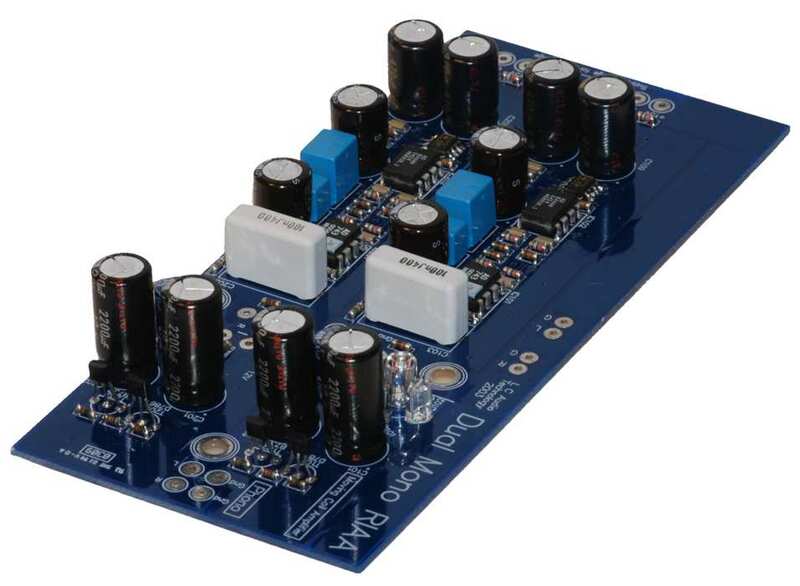 A low cost phono stage will kill most of the details and delicacy of the expensive LP player, and therefore a high quality RIAA amplifier module is required. This is why we designed the Non Feedback Dual Mono RIAA Phono Amplifier with Light Powered Moving Coil Step up. It is designed in 2003, using only opamps from renowned Analog Devices, we ensure the highest possible sound quality. RIAA correction is passive (meaning a RIAA network shorts the filtered signals to GND directly). 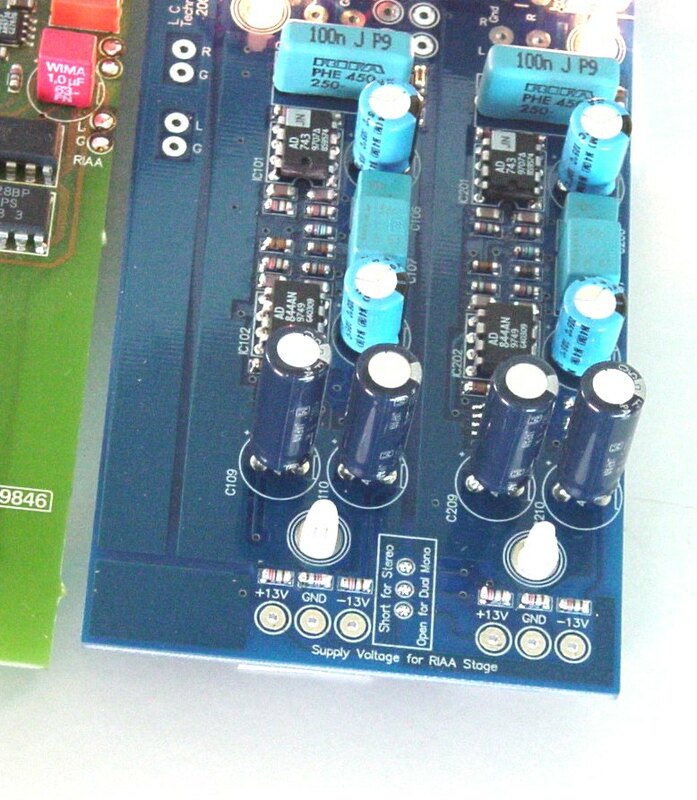 The module contains 2 separate channels, so it can run as a dual mono configuration or a normal stereo configuration. Use of the MC step up is optional, and this section is a clone of the famous 1970's step up, that transforms the currents from the cartridge coil, rather than the traditional way, where the voltage from the pick-up is bled through resistors, and then amplified. The transformation method used in this MC step-up ensures the lowest possible noise floor, and does not call for load impedance adjustments, like the cheaper MC amplifiers found on the market. The special thing about this MC stage is that it does not run on regular + and - power, but rather a series of small power producing photo cells produce the necessary power to run the amplifier stage completely isolated from the power supply. The special light supply setup for the discrete current-to-voltage transformer is shown on this schematic of the MC step up section. Click to enlarge graphic. 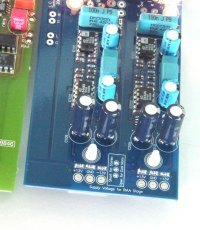 This module is intended to build into a preamplifier, the LP player or a separate box, mounted away from the required 12V power supplies (plus and minus). This is to avoid transformer hum from entering the delicate ultra low signal amplification circuits. In the input of the amplifier one single DC blocking capacitor (100nF Polypropylene) is found, apart from this the amplifier is completely DC coupled. The modest use of DC blocking caps ensures the highest degree of sonic clarity and highest level of details. One of the most important features of a high quality RIAA phono amplifier, is low noise. In quiet passages of the LP no noise should be allowed to reach the listener. Total silence is possible, and should therefore be given to the user of the best available phono amplifiers. In our phono amplifier we use low noise op-amps, from one of the worlds best manufacturers, Analog Devices. The lowest noise op-amps in the world have something like 0,9nV/sqrt Hz, this is very low noise, and equivalent of the noise from molecular thermal movements in a 75 Ohms resistor. However this is a spec for voltage noise, and can only be maintained at low input impedances. (The resistance that loads the input of the amplifier). At high input impedances like the phono cartridge 47k, (or DC resistance of some 10k), another noise spec takes over the scene, the Input Current Noise spec. Current noise of the lowest Voltage noise op-amp is some 2 pA/sqrt Hz. (Pico Ampere per sqrt Hz). At 47k input impedance the resulting voltage noise is 2 pA x 47.000 or 94.000 pV = 94 nV / sqrt Hz. So you see when the 94 nV is added, the 0,9 nV we just paid good money for is not to much use. Therefore we used the op-amp with the world's lowest noise at high impedances like 10 - 47k. AD743 has 2,9 nV / sqrt Hz, (a bit higher than the lowest possible 0,9 nV) but only 7 fA / sqrt Hz. At 47k impedance the current noise only contributes 329 pV / sqrt Hz, so still the low voltage noise is the main noise contributor, but it is very, very low noise. RIAA 2003 is 2 100% separate channels, and able to run in either Dual Mono setups or as a normal stereo setup. 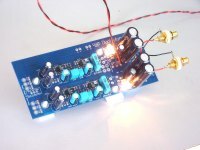 If you use the stereo setup, you can short the three solder bubbles to link the power supplies together. The output terminals are placed conveniently to connect to our Line Preamp mainboards. The module is assembled and tested at time of delivery, so you are sure to get an instantly working result. Click to enlarge photo. The RIAA network is a passive network, current controlled with the AD844 compensation pin. This ensures optimized noise performance, and NO feedback loops in this part of the circuit!